The iOS version of Firefox, which had been noticeably absent from Apple's mobile devices, syncs browser history, bookmarks and open tabs across devices. 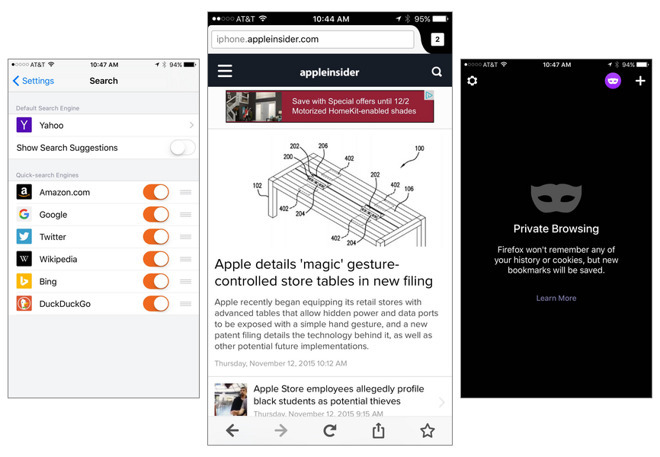 Like its desktop cousin, Firefox for iOS also features privacy-friendly functions like a Private Browsing mode and the ability to clear passwords and browsing history with a single tap. Other features include intuitive visual tabs designed to make content easier to find, as well as anticipatory search capabilities and a robust list of shortcuts to search providers. Search is available from traditional options like Google or Bing, as well as more privacy-conscious options like DuckDuckGo. Talks that Mozilla was finally working on an iOS version of their famed browser first started in December of last year. Previously, the company had provided an app called Firefox Home that was designed solely to sync users' history & bookmarks with their Apple devices, but that was axed in 2012. As of October of this year, Mozilla held 9.52 percentof the overall browser market, including both computers and mobile devices, according to StatCounter. That put it in third place, behind Google Chrome at 46.7 percent, and Apple's Safari with 11.96 percent.